I am constantly inspired by the things around me, and the wonderful things on the blogosphere. As soon as I spotted these stunning glittery ankle boots from Amazon Fashion, I knew I had to have them. I really couldn’t be happier when I got these glitter boots in two colors. And, man…they are comfortable. They feel like wearing a sock, if that tells you anything. I will probably buy another pair in the future in another color maybe in light blue, I love them that much. So excited to wear these with skinny jeans!! 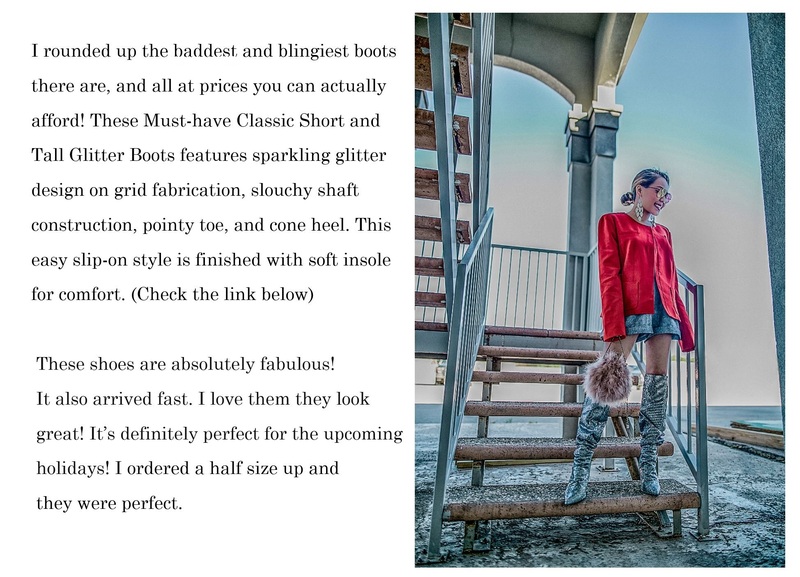 Must Have ankle and OTK boots from Amazon Fashion. Finding the perfect paid of ankle or OTK boots is an essential shopping goal. From heels to flats and Chelsea boots to biker boots, a good pair can be styled all year-round, no matter the weather. Thank you so much for stopping by. Have a fabulous weekend! This is a sponsored post brought to you by Amazon Fashion. The opinions are completely my own based on my experience. Love these boots and the way you styled them with this cute dress ! You look beautiful and I love how you styled those boots! How fun are those fabulous books! Also love that romantic frilly dress! Your looks are so freaken perfect with these boots babe! I’m really feelin both of them. You’ve inspired me to want to get a pair (or two) of my own and rock them out. I’m not really a sparkly fan, but you’ve convinced me to be one, lol. Thanks for this. Loooooooove your boots. So glam doll. All those boots are so fun and they really do go so well with that beautiful dress! Loved the boots… loved how it looked with the dress.. Total Class.. I love glittery and sparkly boots! You look so fabulous, Len! That dress looks so fabulous on you dear! And you definitely picked the perfect boots to pair it with! TheLenParentStyle.com participates in select affiliate advertising programs.